For other savants, actions speak louder than words. 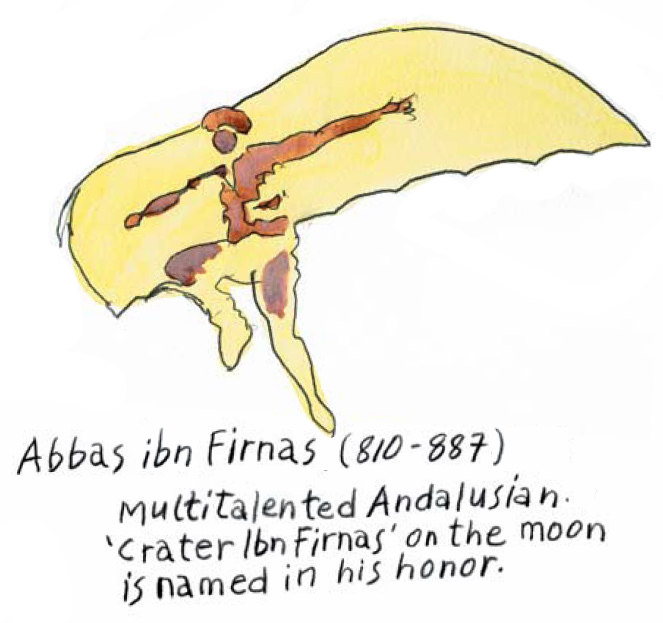 Unheralded, the Andalusian scientist, inventor, musician and poet Abbas ibn Firnas glided into history with the ﬁrst successful ﬂying machine in the ninth century ce. 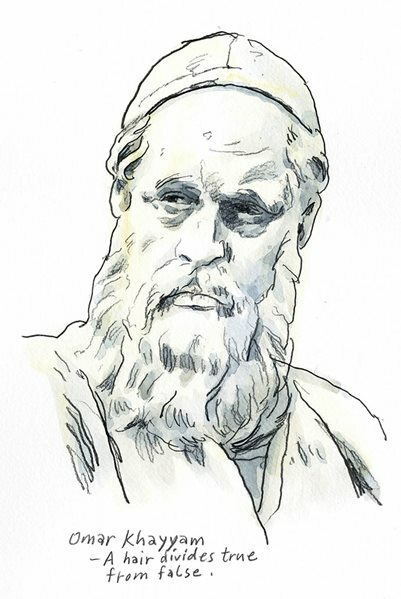 Do not call him the Andalusian Leonardo da Vinci, for da Vinci came along 600 years later—as the Italian Ibn Firnas. My own ingenuity touches upon one of Ibn Firnas’s other creations: his planetarium that could simulate thunder and lightning. 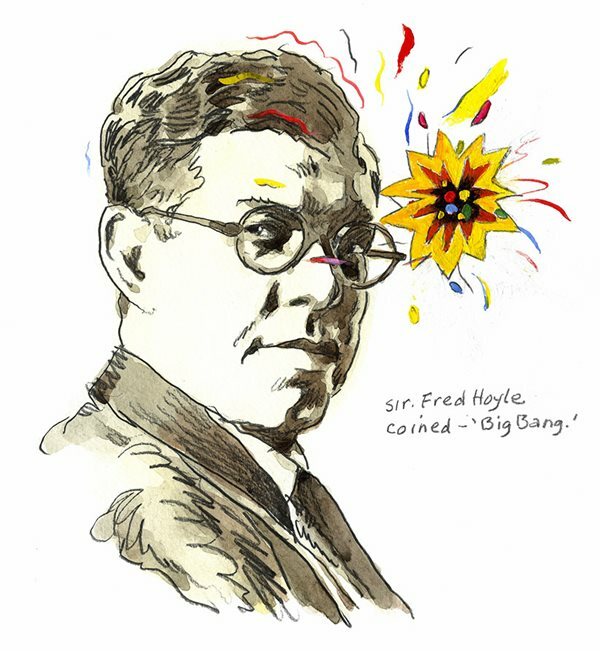 My words, too, are as pithy as any uttered by other great scientists: “FVLGVR CONDITV.” Get it? Well, I guess I am not surprised. Have a seat, and let me explain it. I am a scientiﬁc and historical marvel from what you call the Kabylie region of modern Algeria. Something extraordinary happened here 2,000 years ago, and I’m the fellow who put it on record. Sure, I could have been verbose about it, but since the whole thing happened in less than a second, it seemed silly to be long-winded. Wind was actually part of it. And rain. The sky cracked, and a blinding light ﬂashed. Beasts scattered. People cowered. The place was forever changed, and it was my duty to explain it. So I did, in those two unassuming Latin words. In English, they mean, “Lightning was buried here.” Yes, I am the gravestone of a thunderbolt and all that it struck. No unsuspecting creature must ever step on any of it, for these things belonged to the Roman gods. I am like one of your modern warning signs telling folks not to wander into a mineﬁeld. To issue this admonition, I take the form of an inscribed piece of local stone measuring about 32 centimeters square and 14 thick. Short and to the point—that’s me, yet my Roman words and my Berber stone bridge the traditions of a much bigger world. I represent all human reactions to lightning, from the religiosity of the Etruscans and the dread of the Romans to the romantic poetry of the Arabs. My task is to bring atmospheric science down to earth by commemorating a lightning strike. If you think my job is easy, consider how few have done it. Go ahead, name a famous thunderbolt other than mine. Fictional ﬂashes don’t count, including the ones that stirred Frankenstein to life or boosted the “ﬂux capacitor” in the blockbuster ﬁlm franchise Back to the Future. 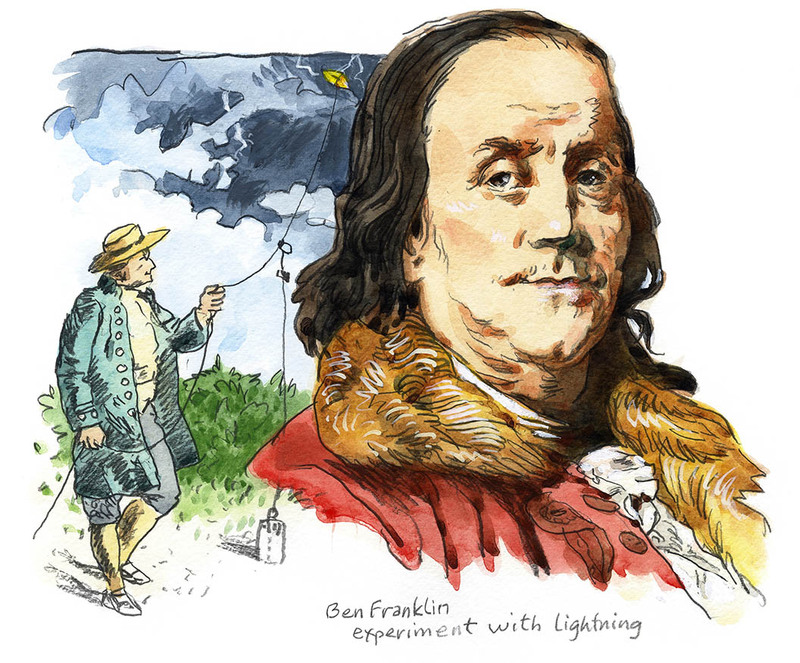 If you stick to science, you might be lucky enough to remember one actual case—the lightning that lit up Ben Franklin’s kite in 1752. Yet lightning occurs constantly. At this very moment, there are about 2,000 thunderstorms in progress around the world. In the time it takes you to read this sentence, as many as 600 bolts of lightning will have struck the ground. 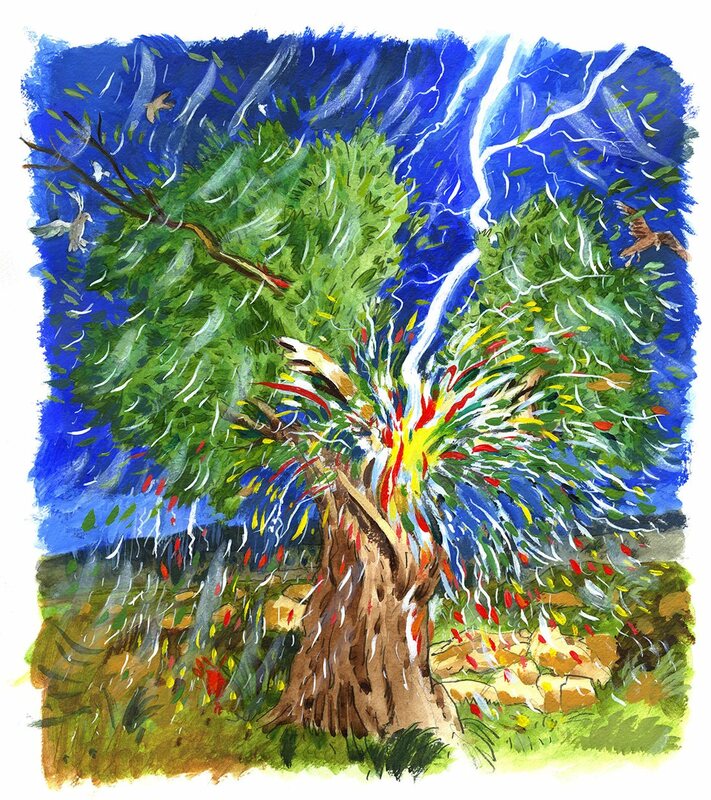 Even so, nearly all of the 31.5 million thunder-bolts generated annually will escape the annals of science and history. My bolt is one in billions. It struck the earth near Bida, a town nearly 150 kilometers east of Algiers. The folks in that idyllic setting of mountains and streams did not take this incident lightly. They consecrated the spot in an elaborate ceremony reﬂecting their reverence for something their science could not yet explain. No one then could fathom the true mechanics of lightning, much less measure its properties. They could not perceive that a thunderbolt was not a single event, but a series of strokes traveling up and down in pulses lasting millionths of a second each. They could not calculate that one of these pulses could reach temperatures four times hotter than the surface of the sun, or that this phenomenon cooked the surrounding atmosphere so rapidly that the air itself exploded in a violent thunder-clap. Lacking satellites, labs and photography, the sharpest human minds of the pre-modern era made the best guesses they could.When eighth-century Syrian scholar Ibn al-Bitriq sought out the Greek wisdom of Aristotle, al-Bitriq’s Arabic translation and commentary on the philosopher’s Meteorologica preserved and passed on to Europe the view that lightning spilled out of ripped clouds. To this work, Ibn al-Bitriq added ideas of his own about the signiﬁcance of different colors of cloud and thunderbolt. Of course, most ancients found it easier to imagine that lightning had a divine origin and a divine purpose. Many of you modern people still react this way: The closer the zap, the more introspective and religious people of any era are likely to become. I know this ﬁrsthand—that’s why I’m here. He developed a phobia about thunder and lightning so severe that he always wore a piece ofsealskin as a protective amulet. The most powerful man in the world would hide underground in a vault whenever a storm approached. He took these precautions because experts assured him that lightning never strikes seals and that it never penetrates deeper than 1.5 meters into the ground. 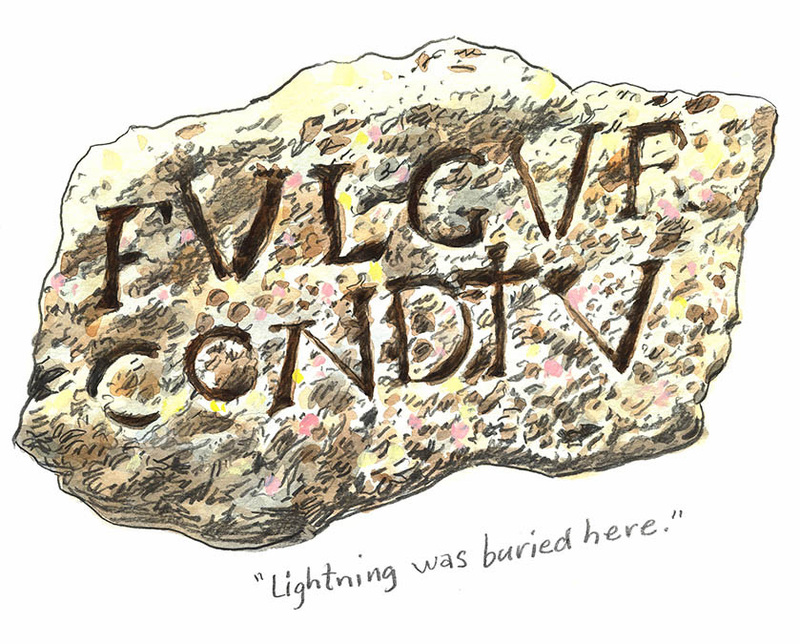 Similarly, Augustus’s successor, Tiberius, wore a laurel wreath during thunderstorms since it was also believed that lightning would not touch it. But a later Roman emperor was not so fortunate. In 283 ce while lying in his tent near the Tigris River, Carus reportedly fell victim to a lightning blast so powerful that the thunder alone frightened many companions to death. Perhaps they should have brought along some nephrite, a stone long favored in the Middle East as protection against lightning, according to the 13th-century writer Ahmad al-Tifaschi. The Romans of my youth took a keen interest in the ubiquitous and unmistakable power of lightning. They inherited this meteorological obsession from their forbears in Italy, the Etruscans, who in turn had been influenced by the Greeks. The Etruscans looked upon lightning as an awesome, direct communication from the gods. If properly interpreted, lightning and its thunder provided the surest omens about the future. This compelled the Etruscans to observe and record everything they could about thunderstorms, compiling in the process an encyclopedia called the Libri Fulgurales (Lightning Books). Priests consulted these volumes for centuries, since not a ﬂash nor a rumble could safely be ignored. The Etruscans identiﬁed nine gods who could hurl 11 different kinds of thunderbolt. They classiﬁed lightning strikes based on entry and exit points and whether the bolt drilled a hole through, shattered or set on ﬁre whatever it hit. Priests cataloged the curious abilities of lightning to melt the coins in a moneybag without harming the bag itself; to destroy a sword and not its sheath; to kill a fetus but not affect its mother. The mysteries of lightning left the Etruscans spell-bound, and they handed on this legacy—complete with their Libri Fulgurales—to the Romans. The Berbers of my birthplace compiled their own lore about the omens of iggig, which was their word for thunder. 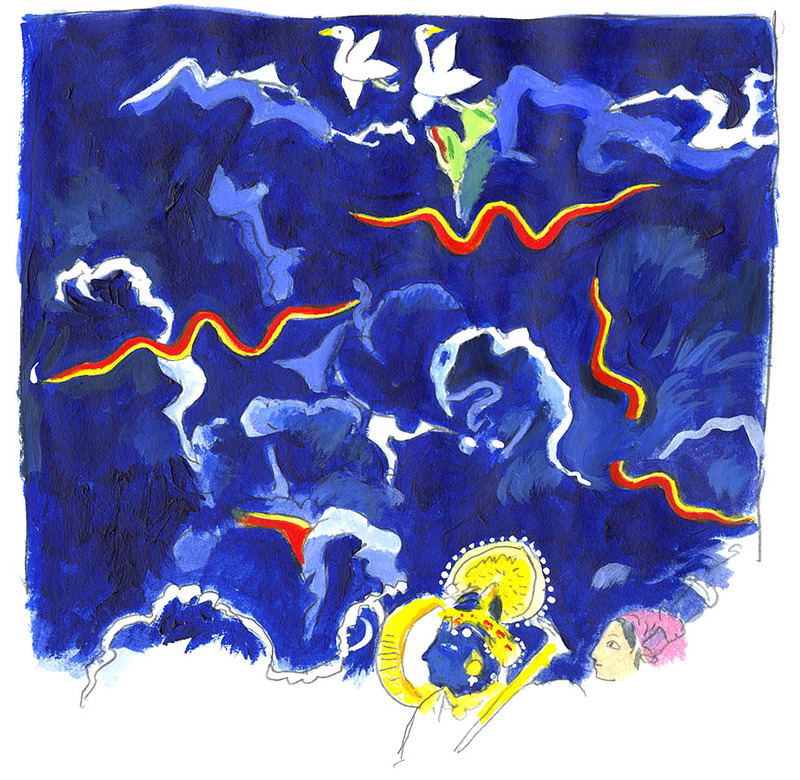 They imagined it to be the sound of the angel Sidna Jebril moving his wings. Whenever this was heard, three eggs of a laying hen must be painted with soot, or none would hatch. A rumble in summer warned of disease and death. Even more terrifying was usman—lightning—and people were instructed to hide their eyes and say a prayer lest they go blind. How-ever, if at the same time a person afﬂicted with warts were to rub his hands together, he would be cured; a piece of wood from a tree struck by lightning could be burned and the smoke inhaled by the sick to lift a fever. The cultures of the world have conjured many gods of lightning, from Amm of South Arabia to Tlaloc of the Aztecs. I assume you are most familiar with Zeus, the Greek god, who became Rome’s Jupiter. Zeus allegedly got his thunderbolts from the one-eyed Cyclops brothers, whose names just so happened to be Thunderer, Flasher and Vivid. Armed with these terrifying weapons, the great sky-god enforced justice and punished hubris. 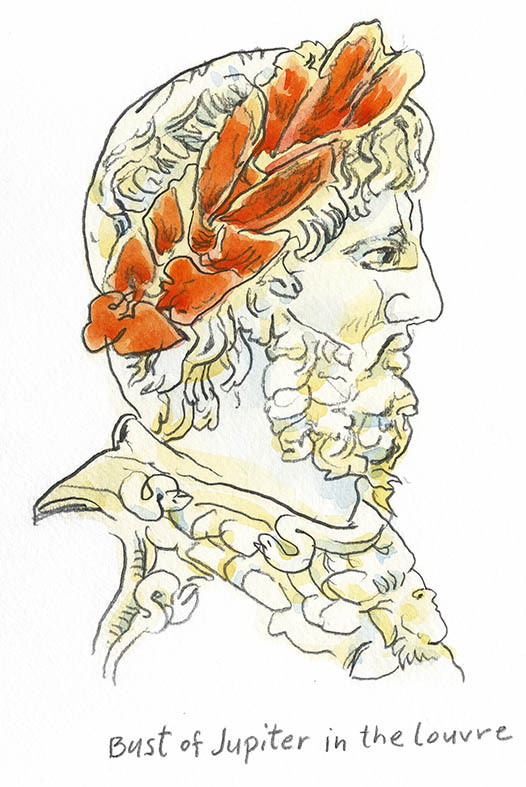 For example, Zeus was said to have killed King Salmoneus of Elis because the monarch tried to imitate the god by rumbling a chariot across a bronze bridge while tossing ﬁery torches to the ground, which incited the deity to deploy real lightning to humble the pretender permanently. Only a few people have ever played the part of Zeus and lived to brag about it. Alexander the Great, hiding behind his claim to be a son of Zeus, was perhaps the ﬁrst to let it be known that he personally wielded lightning bolts in battle. To advertise, the conqueror minted special medal-lions showing himself in full battle gear clutching a large thunderbolt in his right hand. Roman Emperor Marcus Aurelius later copied this mintage following a victory in which, so it was said, he directed lightning strikes against enemy positions. This sort of thing could get out of hand, of course. Some Etruscans once prayed for lightning to save them from a monster named—aptly enough—Volta, only to have their entire homeland consumed by a barrage of thunderbolts. You can be sure they noted that miscalculation in their Lightning Books. Greeks, Etruscans, Romans and Arabs saw a lot of things in lightning, but some of it you might not recognize today. Other traditions appear less preoccupied with war and punishment. You will ﬁnd in much sixth-and seventh-century Arabic poetry an important trope called the lightning-scene. The oldest record of this theme appears in the work of ‘Abid ibn al-Abras, and it features a lovesick protagonist whose beloved has ridden away from a Bedouin camp with her tribe’s caravan. Distraught, the man’s yearning deepens during a long, sleepless night, during which ﬂashes of lightning on the horizon signal his distant love. These are not the murderous thunderbolts of a vengeful god, but the melancholy markers of an unrequited romance. Greeks, Etruscans, Romans, Berbers and Arabs saw a lot of things in lightning, but some of them you might not recognize today. The very appearance of the stuff has mysteriously changed. Ask any modern youngster to draw lightning, and you will probably be handed a piece of paper with a three-stroke zigzag across it that resembles a stretched out letter “Z”—just like the one on Harry Potter’s forehead. This representation has become a nearly universal modern symbol for an actual thunderbolt, as well as a handy advertising logo suggesting speed and power. I doubt any-one today would draw lightning as the ancients saw it. On the medallions of Alexander I mentioned, the thunderbolt appears as a straight shaft with antler-like prongs facing opposite directions on either side of the king’s hand. On the coin of Marcus Aurelius, the bolt takes the form of a long skein of yarn with cotton-candy swirls. Some other ancient images of lightning might be mistaken these days for birds, bugs or bizarre ufos. Since lightning itself has not changed at all, you humans must look within yourselves to explain this. Clearly, your perceptions have evolved over the millennia, inﬂuencing what you think you are seeing. In Macedonia, Greece and Rome, coinage was regarded as a means of propagating government authority, generally based on the legitimacy bestowed upon a leader by the gods. 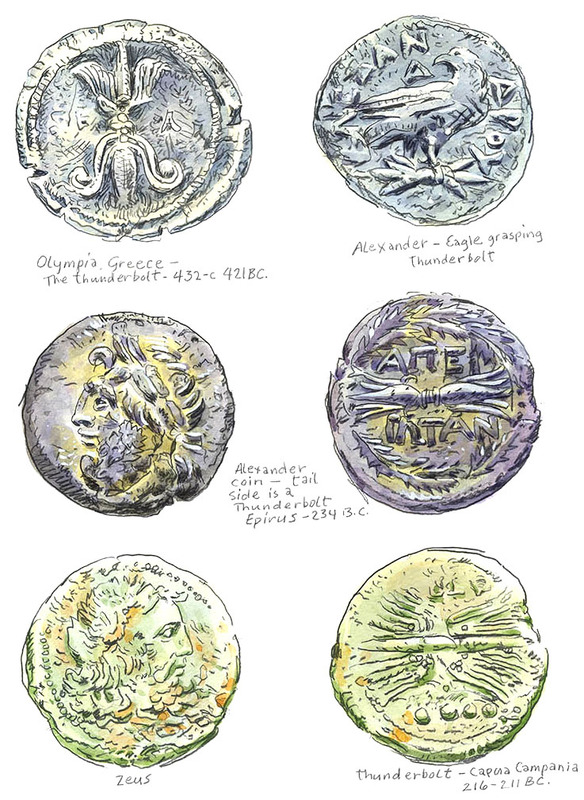 For this reason, it was not uncommon for coins, as these, to depict a city or province’s leader or, as was often the case, deity, together with lightning, in the form of double-ended thunderbolts, to symbolize their power. Stray ﬁnds of Stone Age axes and other implements have been identiﬁed since classical antiquity as cerauniae (thunderstones), an alleged form of petriﬁed lightning. That explains why the Etruscans fashioned amulets out of ﬂint arrow-heads picked up from the ground. The same thing was done in Arabia with small carnelian thunderstones. In fact, the folklore of thunder-stones stretches from Europe to farthest Asia. In some places such as Turkey, they are still used as protection against ﬁre, sick cattle and curdled milk. In Burma thunderstones are ground into powder to be swallowed as medicine. Malaysians used to wrap these stones in leaves and immerse them in a tub of water to induce rain. In Italy thunderstones are said to bury themselves in the ground for seven years, seven months and seven days before rising back to the surface. The mistaken belief that these prehistoric implements were left by the gods, and not by humans, long delayed your realization that the Stone Ages ever existed. 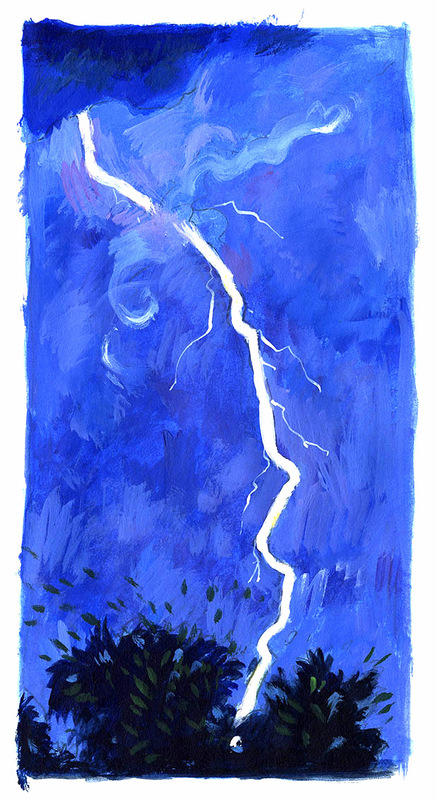 Other objects besides Neolithic weapons were also mistaken for spent lightning. Belemnites (from belemnon, the Greek word for a javelin) are a group of extinct cephalopods whose fossils appeared to be the points of thunderbolts. The same is true of some fossilized sea urchins. 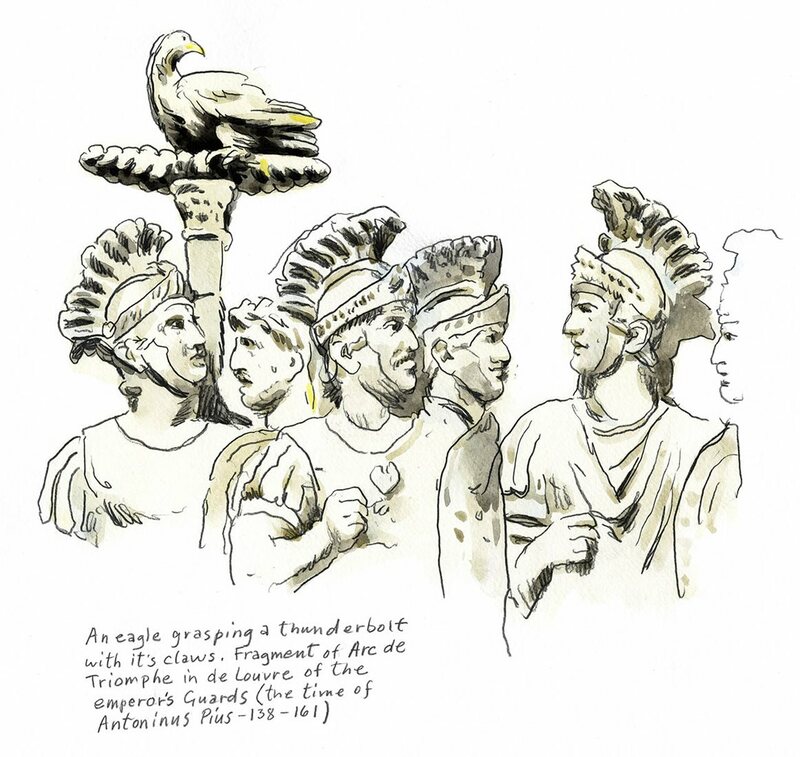 In my youth the people of the Roman Empire followed a hallowed ritual wherever lightning struck. The touch of a thunderbolt transformed the spot into a place henceforth belonging to the gods and not one to be trod by mortals. Perhaps most intriguing to me are the ancient world’s spidery renditions of thunderbolts that closely resemble what scientists now call Lichtenberg Lines. Surely, observant ancients noticed that lightning could produce across the ground or a human body where it hit a radiating wriggle of lines. These markings seemed to indicate the shape of the bolt itself, hence ancient artworks that show lightning as if a leggy insect. Fulgurites, another phenomenon caused by actual lightning strikes, are fragile tubes of fused glass that result from the melting of sandy soil along the pathways of the bolt. They sometimes appear like the antlered thunderbolts held in Alexander’s hand. Until recent-ly, it was not known if peoples of those times actually found and recognized fulgurites as by-products of lightning, but that riddle is now solved. Archeologists in Greece have uncovered a shrine to Zeus atop Mt. Lykaion, where a fulgurite was interred alongside a bronze hand wielding a thunderbolt. This may be the earliest so-called lightning grave, and thus an ancestor of mine. I could not be more proud. The holiness of everything he found. To consecrate what happened here. Hence, my more succinct formulation: FVLGVR CONDITV. I marked the burial of a lightning strike for all to heed out there in the hilly farmlands of North Africa, a task I per-formed until modern intruders moved me. Priests not of my religion, called “The White Fathers” because of their robes, came here as missionaries in the 19th century. They did, however, still speak my Latin language, and they understood my message. For this reason, they kept me at their headquarters in Djemaa Saharidj, where Algerian archeologist Pierre Salama eventually spotted me. Thanks to his efforts, I have been moderately famous for the past 50 years or so. Stones similar to me have been recovered from other regions of the Roman Empire, such as Britain and Gaul, but very rarely in Africa. No matter how you look at it, I am an extraordinary reminder of one speedy, spectacular moment in history. Enlightened, I am sure, you may now continue on your way. But remember, you can’t outrun lightning. So if science is not your thing, I’d keep a bit of nephrite, laurel or sealskin around—just in case. Proud as I am of my job, I wouldn’t want one of me to have to commemorate one of you.